Genesis 20:1 Abraham traveled from there toward the land of the South, and lived between Kadesh and Shur. He lived as a foreigner in Gerar. Genesis 26:2 Yahweh appeared to him, and said, "Don't go down into Egypt. Live in the land I will tell you about. Genesis 26:6 Isaac lived in Gerar. Genesis 26:20 The herdsmen of Gerar argued with Isaac's herdsmen, saying, "The water is ours." He called the name of the well Esek, because they contended with him. Genesis 26:21 They dug another well, and they argued over that, also. He called its name Sitnah. 2 Chronicles 14:13 Asa and the people who were with him pursued them to Gerar: and there fell of the Ethiopians so many that they could not recover themselves; for they were destroyed before Yahweh, and before his army; and they carried away very much booty. 2 Chronicles 14:14 They struck all the cities around Gerar; for the fear of Yahweh came on them: and they despoiled all the cities; for there was much spoil in them. 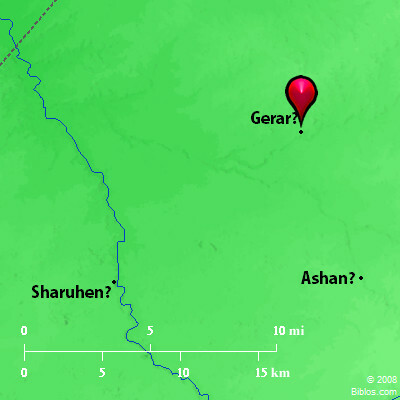 ge'-rar (gerar, "circle," "region"; Gerara): A town in the Philistine plain South of Gaza (Genesis 10:19), where both Abraham and Isaac ' sojourned for a time, and where they came into contact with Abimelech, king of Gerar (Genesis 20 and 26, passim). The place has not been fully identified, but the site is probably in one of the branches of Wady Sheri`a, at a place called Um Jerrar, near the coast Southwest of Gaza and 9 miles from it (SWP, III, 389-90). The site answers fairly well to the statements of Eusebius and Jerome, Eusebius, Onomasticon, that it was 25 (Roman) miles South of Eleutheropolis (Beit Jibrin). It is actually 30 English miles, but distances were not very accurately determined in early times. Gerar was known in the first 5 centuries A.D., when it was the seat of a bishopric, and its bishop, Marcian, attended the Council of Chalcedon 451 A.D., It was also the seat of a monastery. The statements in Genesis indicate that Gerar belonged to the Philistines, and we are led to infer that Abimelech was king of that people, but it is quite certain that they did not occupy this region until after the time of Abraham, in fact only a short time before the Exodus. It is probable, however, that the writer of Genesis would refer to the country as it was known in his day. The town certainly existed in the Philistine period, for it is mentioned in connection with Asa, who defeated the Ethiopian host under Zerar and pursued them in their flight unto Gerar (2 Chronicles 14:13). Besides the locality of Um Jerrar, another place in the vicinity known as Jurf el-Jerrar has been thought by some to be the site of Gerar. Jerrar in Arabic means "jars," and it is doubtful whether it represents the Hebrew Gerar. Jurf means usually "steep declivity," or "precipice," and at the place mentioned many fragments of pottery were found, but this does not necessarily indicate the site of an ancient town. The site of Gerar is discussed in Thomson's LB, I, 196-99 (ed. 1882); Robinson's BR, II, 43-44; PEFS, 1871, 84; 1875, 162-64; 1881, 38. GE'RAR, the site of the ancient town is not positively known, but the uninhabited ruins called Umm el Jerrar, 1/2 mile e. of the Wady Ghuzzeh and 6 ms. s. of Gaza, more probably, the ancient site.